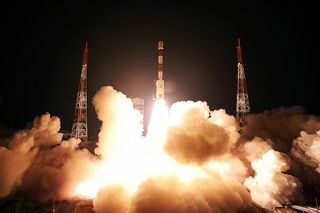 The Indian Space Research Organisation's first navigation satellite IRNSS-1A launches toward space atop a Polar Satellite Launch Vehicle from Satish Dhawan Space Centre in southeastern India, on July 1,2013. BANGALORE, India — The Indian Space Research Organisation (ISRO) successfully launched July 1 the first of seven satellites that will constitute an independent, regional satellite navigation system. "With this we are entering into a new era of space applications after remote sensing and communications," ISRO Chairman Koppili Radhakrishnan said in a post-launch statement. The constellation known as the Indian Regional Navigation Satellite System (IRNSS) is slated to become operational by 2015. The televised launch of the IRNSS-1A satellite on board India’s Polar Satellite Launch Vehicle rocket took place at 11:41 p.m. local time from Satish Dhawan Space Centre in southeastern India. Originally scheduled for June 12, the launch was postponed due to a problem with the electro-hydraulic actuator in the rocket’s second stage. The Indian Regional Navigation Satellite System 1A satellite, IRNSS-1A, is prepared for its July 1, 2013, launch by the Indian Space Research Organisation. It is India's first navigation satellite. The launch vehicle placed the 1,425-kilogram IRNSS-1A satellite into its intended elliptical orbit with an apogee of about 20,600 kilometers and a perigee of 280 kilometers with an inclination of 18 degrees with respect to the equator. "From there, it will be taken to a geosynchronous circular orbit of 36,000 [kilometers] with 29 degrees inclination," according to ISRO. The IRNSS constellation will consist of five operational satellites and two on-orbit spares. The system will cover the Indian subcontinent and up to 1,500 kilometers beyond. The coverage can be extended farther beyond India’s borders by adding four more satellites to the constellation, ISRO said. Building the seven satellites and a ground segment consisting of a network of 21 ranging stations across India is expected to cost around 14.2 billion rupees ($239 million), not including launch. An Indian Polar Satellite Launch Vehicle launched the IRNSS-1A satellite into an elliptical orbit. IRNSS will provide two types of services: standard positioning service using signals in the L5-band to an accuracy of 20 meters for all users and an encrypted service in S-band provided for authorized users. The hub for the IRNSS satellite communication links is hosted at the ISRO Navigation Centre that was inaugurated in June at the Deep Space Network complex at Byalalu, about 40 kilometers from Bangalore.